Just a fair warning: I am from Maine. Stephen King country. Trust a guy who literally lives in the town "It" takes place in, I know my horror. Some of this is going to get weird, spooky, and downright disturbing. If you are squeamish, easily frightened, or are triggered by death or murder (possibly child-related), I urge you to find a different article. I can say with no small measure of confidence that doing the research of this article has probably put me on some kind of list. Also note: These are not full adventures, just ideas. I give just enough information to get a Game Master's mind turning. Take it, remake it, mold it to fit your style of play. Now, onto these five spooktacular ideas for tales of terror. Today's macabre offerings include deadly dolls, terrifying townsfolk, and villainous villages. Synopsis: The Dollmaker is a murder mystery that charges the PCs with discovering who is behind a rash of murders. All signs point to a grieving doll maker, but there is no sign that he has had any hand in the slayings. The further the characters dig, the more they discover about the doll maker, and the more they get the feeling something is following or watching them. The adventure culminates in a battle between the party and a small army of possessed dolls, as well as the vengeful spirit of the doll maker's deceased daughter. What Makes It Scary: The Dollmaker plays on paranoia. The characters will almost certainly come to the conclusion that the doll maker is responsible for the deaths of the families, and is making animated dolls. However, discovering the dolls are not animated or magic throws a curveball into their conclusion, as do successful insight checks revealing the truth to the man's answers during interrogation. The feeling of being watched, only to find a doll laying there behind a corner or at the foot of a bed only heightens the paranoia. As a Game Master, really play up the weirdness. Maybe a character awakes one morning to find a dozen dolls staring at them, dispersed around the room. If characters take the dolls to the authorities, they discover exactly what the PCs do; nothing. Mages, inspectors and the like will come up empty-handed. Something to keep in mind is to keep the reveal of the doll maker's daughter until the end if you can. Hide that room but still give the characters a chance to find it. If they are searching upstairs, describe the faint scent of flowers in the same area as the secret room. What The Characters Know: A string of grisly murders tears through a community. There are no suspects in custody and the entire event has the local authorities scratching their heads. All the victims appear to be middle-class to upper-middle class families. All the families have had a daughter who has had a birthday within the last month. Each of the murders has taken place inside the victims' homes. At each home, there has been no sign of forced entry, and the murder weapons appear to be whatever small objects happened to be laying around. The authorities reach out to the PCs. Either they have some connection to one of the families or they have gained enough of a reputation that local law enforcement feels comfortable having the characters look into the murders. Upon Closer Inspection: Characters who investigate the scenes, and who roll excellent skill checks, will notice that there is something amiss in the room of the daughter of each family. In each case, there appears to be something missing from the bedroom, an empty place of honor, possibly for a favored toy. A Clue! : At the site of the last murder, one of the victims was found clutching something in their hand; a torn piece of blood-spattered lace. Development: The common connection to all the murders is that each family bought their child a doll for their birthday and each doll was purchased from the master doll maker Aldin Friel. Each doll that was sold to a child is currently sitting on a shelf in his humble little shop, including one that has a piece of dress missing... a lacy dress. Characters who ask around about the doll maker are subjected to the sad story of poor Aldin Friel, a widower whose only daughter passed away several months ago after being struck by a passing carriage. If the poor man's luck wasn't bad enough, sick and twisted thieves broke into Friel's family crypt and stole the body of his little girl. Characters who openly confront the doll maker and make accusations that he somehow had a hand in murdering the families are met with a weeping, grieving man who has no idea what they are talking about. Mages and the like who cast detect magic on the dolls find no trace of magic. A search of the shop will find nothing out of the ordinary (Hidden Bit: There is a locked door hidden behind a secret wall upstairs. Aldin explains that it is his daughter's room and wishes for it not to be disturbed, which is why he closed it off. If prompted to open it, Aldin refuses). Characters that leave get the feeling they are being followed or watched. Doubling back reveals a lone doll laying on the street, in a room, or under a table. Inspection of the dolls shows there is no hint of magical energy. Once the characters eventually turn in for the night they are met with the arrival of a small army of animated dolls wielding various implements. the dolls fight until destroyed. Further confrontations with the doll maker result in more dolls attacking at the shop as well as the doll maker himself jumping into the fray, his eyes glossed over. GMs can decide how to close the battle here, but the end result is the reveal that the dolls, as well as Aldin himself, were all being controlled by the ghost of Aldin's daughter. The girl hated the children her father made toys for. She felt that in a way they were stealing her father away from her since he put so much time and effort into his craft. This became especially hard on her after her mother died. Aldin, who was tormented and driven mad with grief, was the culprit that stole his daughter's body from the crypt because he could not stand to be away from her. He placed a porcelain mask over her face and dressed her like one of his dolls. Characters who enter the daughter's room are struck by the horrific scene before them. A child's body, laying in bed as if asleep, dressed in doll-like clothing, her grey, withered flesh is seen here and there. Flowers of every variety are piled around her and on every surface in the room, helping to mask the sickening odor of death and decay. Any who approach the bed are beset upon by the angry ghost of the little girl. She continues to attack until her body is buried on hallowed ground or is splashed with holy water. Synopsis: The characters receive a letter from an old friend or acquaintance pleading with them to come to the town of Dulderien. The acquaintance, without going into detail, informs them that something is terribly wrong and expresses a feeling of paranoia. The letter looks to be hurriedly written. Upon arriving, the characters discover a picturesque town full of happy, smiling people preparing for a harvest festival. If the characters can find their contact with ease, and they appear to be in good spirits but has no memory of the letter. Folks around town are chipper and will talk animatedly with the characters. They actively seek to make the PCs feel as welcome and comfortable as possible. Sometime after nightfall, droves of townsfolk flock to a farm on the edge of town. There they enter a barn and do not return until just before dawn with one less person than when they started. This continues each night. Development: If the characters ask around town as to what the townsfolk's' nocturnal habits are all about, they will explain that the barn is where they hold town meetings. A cursory inspection of the barn's interior will reveal a set of chairs and a small stage and lectern. Should the characters continue to ask further questions about that is going on around town, the town's mayor will invite them to his home for dinner where he hopes to clear up any of this business. There he intends to poison them with a powerful sedative and join them with one of the insidious parasites that have afflicted the town. The parasites themselves look like small, slug-like creatures with lamprey-like mouths lining its underbelly. These creatures attach themselves to the spinal cord of any living creature and can control it. It secretes a chemical into the spinal fluid that produces high levels of dopamine and adrenaline, giving the impression of a happy, energetic populace. It also makes their hosts complacent and able to carry out tasks. The townsfolk are busy unearthing a terrible eldritch entity. Deep below the town is a lonely, subterranean lake. In the lake lives an aboleth (or whatever Lovecraftian horror you wish to stock there). The creature awakened a few months ago when the town dug a new well (near the aforementioned barn) and penetrated the lake. The creature has since been using the parasites, both in the water supply and through its new thralls to convert the rest of the town into obedient slaves. Should the characters learn of this, either through good investigation skills or by resisting the onset of the parasite themselves, they are faced with a few grim options; Go after the thing (the likely choice) or flee and let it have the town (the less likely, but smarter choice). Should the character decide to confront the creature, it should be a difficult battle on the creature's home turf. But that's not the terrifying thing. Where the fear lives here is in the townsfolk. They go from friendly and welcoming to psychotic rage at the mere mention that the characters wish to do harm to their new God. In fact, treat every townsperson like they just entered a barbarian's rage. They will throw themselves with reckless abandon at the party, fighting to the death with fist, tooth, and tool in an attempt to protect the creature. To do battle with this monstrosity they will need to either sneak past or kill everyone in town. Every man, woman, and child. Once the creature is dead, the parasites become inert. Before that, it requires a lengthy surgery to remove any of the parasites from a host. A failed check could mean death. These things are hooked right into the spines and nervous systems of their hosts after all. Subsequently, just ripping one off will kill the host as well. What Makes It Scary? : It's not the creature or the body-snatcher-esque parasites that are controlling the townsfolk that makes this adventure scary. It's futility. By the time the characters arrive, everyone in town has been turned. They are now thralls to the creature below Dulderien. The choices the characters make, no matter how noble they may seem, carry a weight that makes them almost not worth it. To fight means to, most likely, kill a lot of townsfolk. To flee means to surrender the minds and bodies of the people of Dulderien to the creature and whatever unknowable plan it may have. The townsfolk get to live, but they will never be free. The weight of the decision if what makes this horrifying, knowing that no matter what the party decides on, the characters will have to live with the ramifications of their choices for the rest of their lives. There is a third option that I hadn't mentioned. The one where the characters just give up and let themselves be taken by the madness of the creature and its parasites. This one, sadly, is one of the more cheerful endings. Not having to live with the guilt of their choices, they can just let go of themselves and give of themselves to their new God. Long may it reign. A Little Backstory: This one is cheating a bit, but I think it bears repeating. A while ago I wrote an article called 5 Villages With A Dark Secret. The title pretty much says it all. In that, I detailed each village and their terrible secrets. Each one had a little twist to it that was unnerving or unexpected. The last one, the one I am presenting here, put everything up front. The moment the characters spotted the village, they knew that something was wrong. The problem is, if you see the village, it is probably too late. That thing that is really scary about this is there isn't a monster. Not really. All the depraved acts are perpetrated by people. Just regular(ish) humans. They may be malformed, insane, and messed up beyond all reasoning, but they are still people. Not ghosts or witches or anything supernatural. Just people. Synopsis: The characters are traveling through an isolated, heavily forested area. They could be on the way to or from something, but the idea is they are currently alone in the forest. They happen upon what appears to be an abandoned village. This village shouldn't even be where it is. The location is so remote it is a wonder that people live here at all. What's more is that there isn't a road anywhere nearby, and by best account, the closest one is a day away. The buildings look like ramshackle huts with thatched roofs, cobbled together with rough pieces of lumber. An open-air smithy and a large wooden structure bearing seemingly religious symbols are the few typical accouterments of a normal village. There are no shops or inns. Not even a tavern There are no streets, either, but rather well-worn paths that traverse the distance between shacks. Each "home" has some manner of livestock fenced adjacent to it, be it hogs or chickens. The air is thick with the scent of mud, blood, wood smoke and rot, but there don't appear to be any people. If the characters investigate the area, they find several disturbing things. Humanoid body parts, cages large enough for small creatures of regular children, bizarre artwork depicting violence and death, wicked-looking weapons with what appears to be flesh and dried blood adorning them, and holy symbols to a good God or Goddess, perhaps one a member of the party worships. Whether the characters decide to investigate or get the hell out of dodge, they soon are met by the village's inhabitants; a community of misshapen, somewhat savage, inbred isolationists that revere a the good-aligned deity but twisted the religion in such a way as they use it as justification to carry out unspeakably horrible acts of brutality, murder, and worse. The villagers are just returning from a church service where they have spent much of the day mutilating their own malformed bodies. As soon as they discover the characters have been anywhere near the village, they immediately begin hunting them down. The villagers are expert hunters and trackers, making escape difficult, if not impossible. The villagers intend to offer up the "Outsiders" as an offering to their deity, then use their bodies for meat, tools, or macabre decoration. The characters need only survive. A task that is a feat in and of itself. GM Tips:The horror here is that, despite being badass adventurers, the PCs are faced with something that cannot be reasoned with, bargained with, or intimidated. The villagers will throw themselves at the characters, dying in the process no doubt, but will keep coming. They exalt in pain, be it their own or in others. Hiding from them is all but impossible save for magical means, and even then the characters only have so many uses To really pile on the tension, make the area really, really remote. Like three or four days from even the most basic sign of civilization. The villagers here are really the bread and butter of the adventure. The more messed up and insane you can make them, the more impact they are going to have on your characters. When describing them, really play up their physical features Years of inbreeding have made them psychotic and inhumanly strong, with gruesome deformities like vestigial limbs and half-alive vestigial twins jutting from their malformed bodies in strange ways. These "people" sometimes adorn themselves in horrifying garbs, like necklaces of teeth or ears, tongues, or fingers (all humanoid). It wouldn't be odd for a few to be running around wearing a bloody hog's head. When interacting with the villagers, remember they are religious zealots and very, very insane. Spout off twisted scripture. Have them scream or babble. Maybe there is a lone villager staring at a tree, not moving, and then suddenly starts screaming, bashing their head bloody against it. For inspiration on how to really capture the messed up behavior of madmen, watch a playthrough of Outlast and Outlast 2. And there we have it, three terrifying tales to tell during the most horrifying time of year. 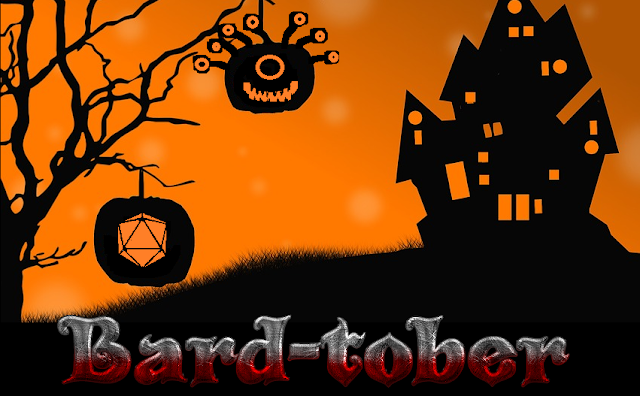 For forth Game Monsters, and spook up your next session with a little fright. More Halloween puns to come. Looking for a specific article? Just want to browse the archives? Wander over to my Master List, a directory of every article I've ever written, right here.